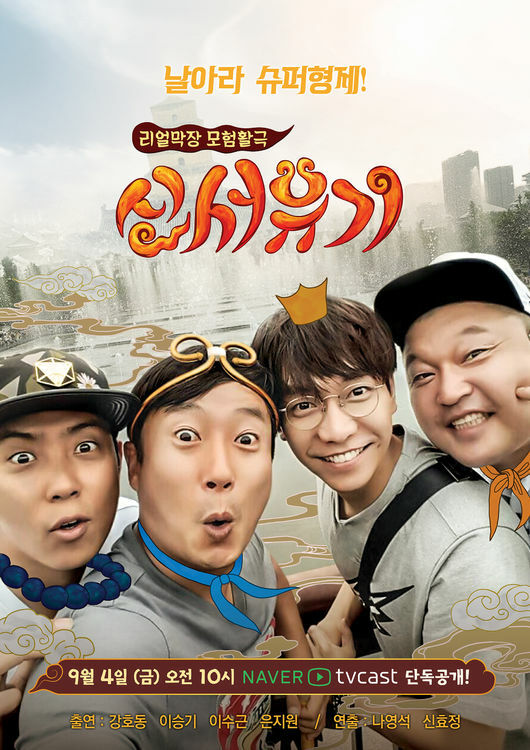 Upcoming variety show 'New Journey To The West' has revealed its official poster. The poster gives off a cheerful atmosphere as Lee Seung Gi, Kang Ho Dong, Eun Ji Won and Lee Soo Geun are all showing their bright smiles. Little cartoon details are also included in the poster to emphasize on their respective roles which are Xuanzang, Sun Wukong, Zhu Bajie and Sha Wujing from the original Chinese novel 'Journey To The West'. In particular, the first trailer of the show which was revealed on August 25th is said to have exceeded more than 1 million view and is currently a hot topic among netizen. 'New Journey To The West' will be broadcast through Naver PC and Naver TV Cast on September 4th at 10PM KST.